Whether it's an acute injury or something chronic or occupational, we all have things going on with our bodies. If you don't have anything, you are lucky...or you are just avoiding any activity that may bring attention to let's say weakness in your wrists, your back, your neck, or avoiding any strenuous activity on a regular basis. The sedentary life is causing chronic injuries, and we often use the sedentary life to try to avoid anything from flaring up those injuries. Using the problem as the solution is not a long term acceptable solution. Majority of joint injuries now are non-contact, meaning it wasn't from sports or a car accident, or running into something, it was from joint overuse and incorrect joint arthrokinematics (how joints move in relation to each other). There are also the injuries people sustained as kids, sprained ankles, banged up knees, shoulders, that accumulate over time. Your body is like Jenga, and if those little things aren't properly dealt with, they will cause major problems down the line. It could have also been sustained due to an illness, disease, or the after effects of surgery. What if I just want to get strong or athletic? 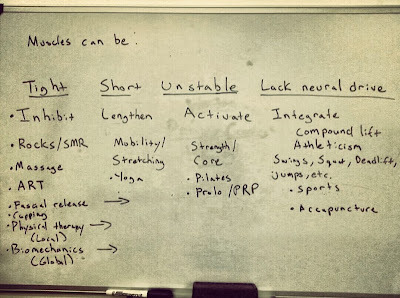 Correcting weaknesses or dysfunction allows opportunities for better performance and a longer athletic life. Every professional athlete gets paid for this ability. The strength coach who gets hired, and can reduce the injured roster from 20 to 7 and get the starting line up to the playoffs is the guy with the fat paycheck. Wannabe athletes train like maniacs and focus only on strength, real athletes stay healthy. One thing leads to another, making it worse and worse. And most of our solutions tries to just treat one aspect of this cycle instead of trying to treat the whole cycle. Usually this is the only system people diagnose and treat and its why we've done such a poor job with joint healing and pain management. We look at the local area that's hurting, and treat that area. We can use chiropractors, acupuncture, medicine, physical therapy, massage, gadgets, and surgery. And the majority of times people who go under the knife never needed surgery, they turned to it only to manage pain, not because it actually healed the area. This is of course not everyone, some people who have complete tears in a major ligament or tendon need it, but the majority of us who get it, this is just not the case. Why do a majority of people get their spine fused? Because moving our spine hurts! So is it to heal it or is it to manage pain? Because we can't alter our movement enough to not move our back in a way that causes it pain. And even without surgery, spines will fuse naturally, and shoulders will freeze on their own to stop movement. Cortisone shots, relaxers, anti-inflammatories, and or straight up pain meds, is it to heal or is it a pain intervention? But pain is there for a reason. Unless you trust common belief (even common medical belief) over evolutionary biology. If the way you move keeps bothering the joint and you don't do anything about it, the joint will. Looking at the local system is only as important as looking at the global system. Up to a certain age, we still create more new cells than cells can have a chance of dying. Our bodies will heal or at least get more manageable if we provide it the right environment to heal. And if we keep moving our bodies in a way which will not allow our bodies to heal, then it won't, it will do the opposite, it will keep getting worse. And you will keep looking for short term fixes. "You gotta go see my guy, he's a miracle worker. I've been seeing him for treatments for years!" There's a problem with that statement, we aren't fixing the problem, we are solving the problem with the problem. 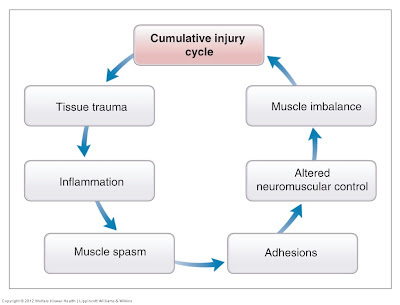 We treat the area and we treat it with one aspect, but the injury cycle creates many aspects that will make the original injury worse and worse. Break the cycle. First get a proper diagnosis. Not all doctors are created equal, and just because they practice medicine doesn't mean they are up on their science. This is where referrals come in, this is where instead of only looking at credentials, you also see if they have a site and if they write for their site, base it off of their content. Many doctors are writing articles to share and pass on their knowledge and information to the public and to their patients. Doctor does not always = sound science. But it should. Local System Treatments - This is where physical therapy (especially with doctors of physical therapy) comes in. I'm not a big fan of chiropractics, there's about 2-3 practitioners I would trust to diagnose and treat injuries and they only rely on adjustments as a last resort. Myofascial release through a therapist, but if you have enough knowledge and training you can do it yourself. ART (Active Release Technique), PRP (Platelet Rich Plasma), and the one that has worked best for me, prolotherapy. Former Surgeon General C. Everett Koop used prolotherapy for some of his pains and went back to school to get certified in it. Some of these things you may not have ever heard of, here's why, because a lot of these practitioners don't take insurance, or insurance just doesn't cover it. A lot of the best body workers are frankly tired of dealing with insurance and no longer need it as a stream of income due to their demand. But many of these treatments, especially prolo are well known among athletes and celebrity health fanatics like Tim Ferriss (which he detailed in The 4 Hour Body) and Joe Rogan. Do what's best for you, don't avoid things that can improve your overall quality of life just because insurance doesn't cover it. Massages aren't covered but we do that right even though it has little to no long lasting benefit. There is this irrational attitude, where people assume if insurance doesn't cover it or they don't take insurance, it must not be that good or legitimate. Wrong. We also haven't heard of many of them because we don't research and we do what's most common or most standard. Common belief/popular belief and truth are not the same thing. 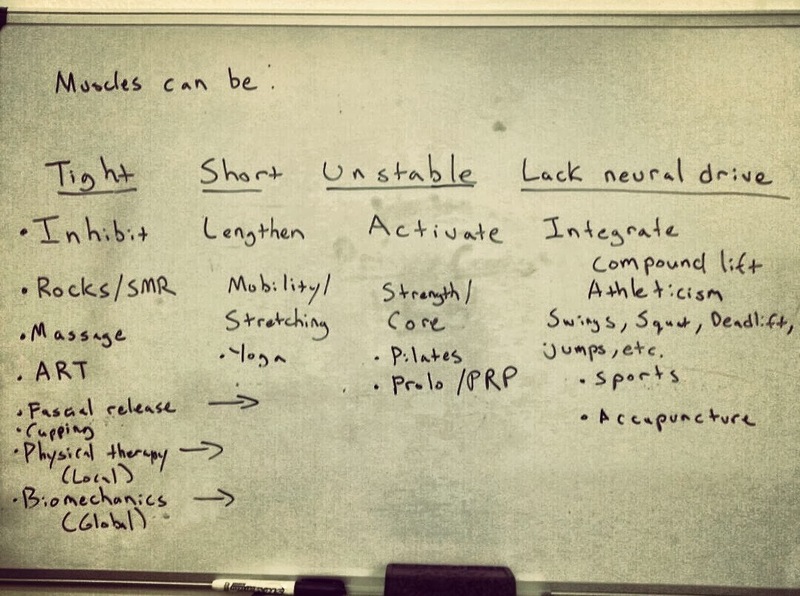 I have posted on numerous occasions about the difference in how regular people train and how professional athletes train, and the techniques of athletes do not trickle down to regular people. It's why the regular population has obesity as an issue, whereas our athletes from the same gene pool are the best athletes in the world. Where a minor injury can mess us up for life, and they can recover in a matter of months. It's time we train and heal just like the people who use their bodies to make a living. Oh but if I haven't heard of it it must not be good. No, if you haven't heard of it, you haven't heard of it and that's all it means. When I ask professional fighters, strength coaches, professional athletes, majority of them have heard of all these procedures. Hell that's how I heard of it. 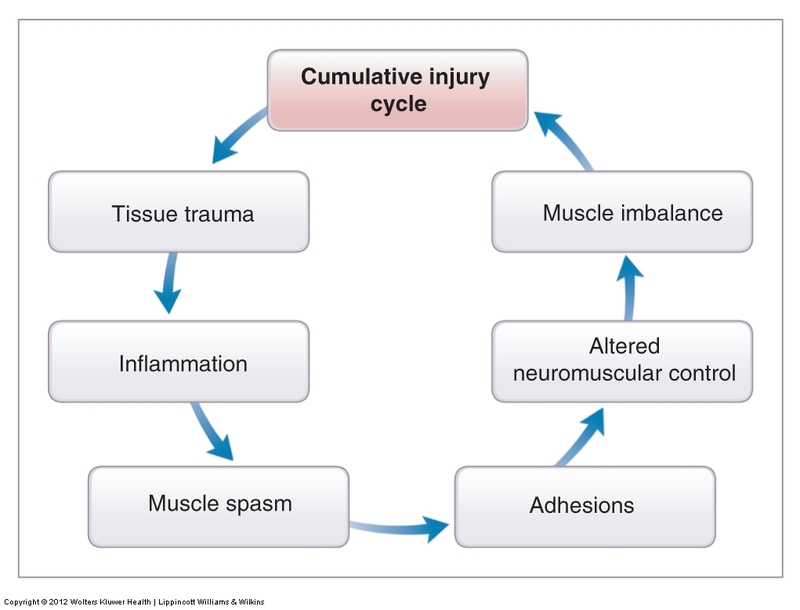 What do I know about pain and injury? A lifetime of martial arts starting at age 6, including wrestling in high school, boxing, MMA, and Brazilian Jiu Jitsu. I have osteoarthritis, scoliosis, torn meniscus in both knees, partial torn ACL and LCL in left knee, herniated my neck twice in training and have basically no space left in my cervical. And I still train and I can still move better and with less pain than a majority of people. And I do body work on myself as often as most brush their teeth. My quality of life is excellent, and so should yours. If not excellent, just...better. After diagnosis and treating the local area, it's time to assess again to see if the problem was really a local problem, or the local system was just a victim of a bigger global systems issue. If there is a bigger issue, we must correct it if we ever want that local area we just treated to heal and not get injured again. And also if we don't want the injuries to spread to other areas. If it was an acute injury, we still have to correct the global system to let your body know that the local area has healed (if your nervous system still thinks its injured it will alter neuromuscular control, cause muscle imbalance, and more injuries), and to provide the local area the proper environment to heal. It's about moving functionally, in alignment, range of motion, posture, muscle activation, stability, flexibility, breath control, strength, and ultimately biomechanics. Like with foot pain, is it better to see a foot specialist or to see how you move and walk? Maybe in severe cases its good to see a specialist but after that, without altering how you move and stand, whatever benefit you got from the specialist will be short lived. I don't know if there are any documented cases in the history of orthotics where someone was healed. But that's not the point, its what I said earlier. The way you move causes you pain, and so we look for pain management interventions to prevent pain. Orthotics being one, surgeries being another. Don't take this as me being against all medicine, I am not, we are relying on it far too often. Like a very good dentist client told me, dentists do root canals too often. Try to save the tooth first, then do the root canal WHEN there are no other options. We take better care of our teeth than we do our bodies. We brush twice a day, floss, rinse. What body work treatments do you do on yourself twice a day? But what do you use more, your teeth or your body? We give antibiotics for everything these days, people often demand it. But it only kills bacteria, not viruses like cold and flu. And how often do we demand and get antiobiotics when we simply have the cold, the flu, or even allergies? "This cold is lasting too long, maybe it's an infection. Take some antibiotics just in case." It couldn't be that the cold is lasting a long time because sometimes that happens, or maybe our immune system has just grown...weak? A lot of it is about convenience and lifestyle. You do what fits your lifestyle (which isn't always optimal) or you can alter your lifestyle to make your quality of life more optimal. Everything is about lifestyle and mindset, weight loss, strength, and especially healing. Global Systems Treatments - This is where you want to find a good biomechanist, DPT (Doctor of Physical Therapy), a great strength coach, CES (Corrective Exercise Specialist), FMS (Functional Movement Screen Specialist), and possibly a very good personal trainer (though again not a big fan of regular trainers and you have to be very selective, I would not feel comfortable referring someone with injuries to a trainer). Look for people who come highly regarded, with a lot of transparency, like I said with doctors, look for people where you can read their content and their thought process. Blogs, published papers, and articles work well here to screen someone. Reviews and star ratings are nice but this isn't a restaurant, its someone you want to help change your life. Don't base it off of stars. My job as a coach is to build resilience. YOU do the rest, including finding happiness. A person who is responsible for a crime or other misdeed. A person who suffers from a destructive or injurious action or agency. With our bodies, its easy to treat or soothe the victim, it feels good, brings initial relief but that doesn't mean you have found the criminal. Maybe your neck hurts, so you rub the back of your neck and it gives you momentary relieve because the compression turns off the nerves that are on fire. I don't know how many of my pains went away once I converted from a desk to a standing desk, and I stopped leaning and hunching over my computer screen. I rubbed my neck all the time but the back of my neck wasn't the issue. Create the environment for healing. Catch the criminal, don't just soothe the victim. The criminal here is most likely the front of your neck, which is pulling you forward. Typically the cause runs away from pain. Your neck pulls forward because the back of your neck hurts. Pain is in the back, the cause is in the front. Right side of your back hurts because the left hip is higher than the right, you pull away from the pain, the criminal is running away from the victim. And if you never actually catch the criminal, or figure out the source, you can soothe one victim, or treat one symptom, but new symptoms will occur, or the old ones will keep getting victimized. We do this in real life as well right? We blame the victim. Its easier that way, then there is no mystery, case solved, and more crimes keep being committed. So we will self diagnose a local area as the victim and culprit, when the culprit may be somewhere else, and you can only see that if you look at your body in a global sense not a local one. Fascia runs all across your body, even into your organs. So does connective tissue, and your muscles all thread through each other, all the bones are connected, its a global system. Treating a global problem locally seems ineffective. And it is. Treat the hurt area (local issue). And alter your biomechanics to allow your body to heal and not have that pain return (global issue). I don't know how often I hear, "just do yoga" as the answer to basically everything even mental issues (this from a guy who is certified and has lived on at a yoga commune before). Or sometimes its, just do pilates. The solution depends on the problem, there is no cure-all. We Americans love quick simple answers and paraphrasing. This article is long and I know you want me to paraphrase it, I can't so get over it. There are now enough studies to show that there are as much injuries through yoga and pilates as any other activity. And in that same token, physical therapists, chiropractors, massage therapists, doctors, and trainers have also inadvertently been hurting their patients/clients for years. One of the lessons we covered with our clients. Part of being a coach is educating clients. In general your muscles can be too short, too tight, too unstable, and lack neural drive (or have too much neural tension). 1. Tightness - This is when the muscle is too overactive. Basically always on fire or always on. Let's say you tried to stretch out or do yoga on tight muscles, and all you get are muscle strains, pulls, or tears. Like I said the solution depends on the issue. You need compression to shut off those muscles. Typical causes are from injury or overuse like being at the computer all day. Tightness can be your bodies reaction to an area being hyper-flexible or unstable. Solutions - At our studio, this is when we use rocks, tennis balls, and trigger point tools on the feet. We also use SMR (self myofascial release) tools like massage stick, foam rollers, the grid, rumble roller, therapy ball, and other similar products to inhibit overactive muscles and break up fascia. See my product list for more info. People use massages for everything but this is when a massage would come in handy, as well as ART, myofascial release therapy, cupping, possibly anti-inflammatories (though inflammation is also part of the healing process, rushing of nutrient rich blood to the injury site), etc. 2. Shortness - Not to be mistaken for tightness, it means the muscle is too short. A muscle can also seem short when it may just be neural tension, this is when having someone who is highly regarded comes in handy. Typical causes, sitting all day and lack of walking or ever doing anything on the floor and only going as low as your chair or your bed. A saying we use in our studios is, we must lengthen before we strengthen. Meaning no one is going to do any strength building until their muscles get to a certain length. We want you to be strong and long, strongest and your longest. Not strong in a very short degree of motion. Lengthening doesn't just mean flexibility, it can also mean range of motion and joint viscosity. You can also train your muscles to be short, classic examples can be crunches to improper bicep curls. Solutions - At our studio we do mobility drills to increase range of motion through repetition. Only at the end of our training lesson do we do static stretching, but typically even then we do active isolated stretching with a rope. Every improvement we make with our clients is based on consistent repetition. Now THIS is when you would use some yoga and stretches at home or Thai massage (again only with proper not cheap professionals). Avoid static stretches before activity unless you want less power output and injury. The only time you can get away with static stretching prior to activity without a loss of power output is when you do SMR (like foam rolling) prior to static stretches. But DO NOT do it on a cold body. You don't want to stretch ligaments or tendons (they will not return to original length (subluxation) and will compromise joint stability), you just want mobility. It's why I'm not a fan of chiropractics, its lengthens ligaments, and once lengthened, they stay lengthened, meaning now you are more likely to move out of alignment again. Then you have to go back for more adjustments. Its when people use the same solutions for all their problems that the issues just get worse and worse. - Most often used form of injury intervention and prevention is stretching. But in studies, the most effective interventions were based around strength, stability, and activation. The least effective but most commonly used was stretching. It's because tightness and shortness are not the most common dysfunctions. 3. Instability - Believe it or not, this is when an area is too hyper-flexible. Like I referenced above with stretching ligaments, it could also be the muscles around a joint are not tight enough. It could be a problem with neural drive. 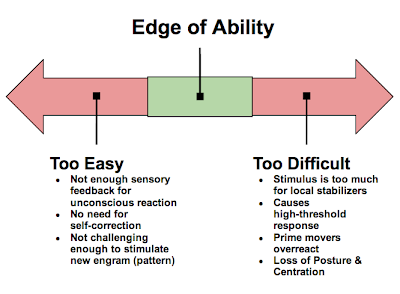 It's great to have a lot of range of motion, it is not good to be hyper-flexible. You don't want a wet noodle as the thing to protect you and your organs from the world. It can also be caused by strain, pulls, dislocations, or tears. Sometimes someone with a hyper-flexible back lacks core activation. When UFC fighter Georges St. Pierre fought BJ Penn who is known for being ultra flexible, he kept attacking the body until BJ couldn't fight anymore. He said in his game planning, that his doctors and therapists told him, ultra flexible people had weak cores, so attack the body. Do NOT mistake flexibility here with range of motion. Nick Diaz and Rory Macdonald use the same strategy in their fights with BJ Penn. A back that is hurting doesn't always need stretching out! It may need core and glute activation. By now you can see how the issues are related. This muscle needs more tightness! Why is it deactivated? Typical causes, maybe you sit all day and one of your biggest muscles you need to protect the back and spine is your glutes. If you sit all day, you are basically using compression like you do with foam rolling to shut off your glutes. But not for a few minutes a day, but hours a day. If you use a laptop from your couch or bed, then it's even worse. Solutions - Strength training would work well here, physical therapy, muscle activation work, dynamic warm ups, core work (not crunches, please not crunches or sit ups) like planks, glute bridges, reverse hypers, supermans, etc. Now THIS would be when you could use pilates as well. For serious injuries I would also suggest prolotherapy or PRP, and in rare cases surgery. 4. Lack of neural drive/too much neural tension - This can affect muscle imbalances, being too tight, being too short, joint stability, or overall balance. This is your nervous system and everything starts from here. Exercise, yoga, martial arts, gymnastics are all housed under the tree of movement. Well all these issues of the body are housed under the big umbrella of the nervous system. Try balancing on one foot, now try closing your eyes and balancing and relying purely on your nervous system to keep you centered instead of your eyes. We have a very similar muscle fiber count to chimps, yet they are much stronger than us. Why? They have much stronger neural drive, we have the strength of a chimp who's had a stroke. And we also don't exercise our nervous system enough, we don't run on terrain, climb things, throw things, pull things, jump, swim in creeks, open water, etc. Let's face it, we are feeble and so is our nervous system. Don't get me started on feeble-mindedness. An example of neural tension would be someone trying to raise their leg up to 90 degrees in an active leg raise and they can't. They think its the hamstrings, its too tense, and its pulling against you. You feel your hamstrings and its loose, that's not the issue. What is? Neural tension. When are you ever moving like that or raising your leg like that? Not often so your body loses that ability, it shuts your nerves shut off. Its why the only way to improve it is through consistent repetition. How come I can raise one of my legs up to my hip, like in a side kick, and the other leg as well but I can't do the splits? I should be able to, they are both independently attached to my hip socket, if I can raise one, I should be able to raise both at the same time. But when am I ever doing that motion repetitively? I'm not so my body shuts me off, because it's wasting needless energy in an activity I will never repeat and I may possible injure myself. There is something called the GTO (golgi tendon organ), it's when you lift too much weight, you reach failure. The GTO shuts you off because you are hitting a limit you have never hit before or it senses too much tension and fears injury. You are not challenging your body, forcing it to keep developing, adapting, you are not living. Causes range from injury (acute or chronic), a sedentary life, or from doing activities that are inappropriate for your body. Solutions - At out studios, this is when we do a lot of balance work especially with the ball or single leg moves. Also speed, agility, quickness, and coordination. Compound lifts, moves using the UAP (universal athletic position) like swings, squats, deadlifts, jumps, along with athletic drills and specific activation work. A good coach (not just a trainer) would belong here as well. A coach is the only one who can put all of this together and also be a source of referrals for different issues. They should also have a system of tests and ways to quantify you and collect qualitative data. A good coach knows how to keep you in the optimal zone to create progress but not at the expense of injury or weakness. This is also when going on hikes, playing sports, competing, playing with your kids or dogs, physical fun can be beneficial. Along with stress management activities like breathing, meditation, visualization, among other things since your nerves may also be on edge or on fire. Now THIS is when you would use acupuncture, trigger points, and acupressure as a way to re-invigorate the body. Pain is a manifestation of the nervous system and these modalities treat the nerves. Dietary changes, proper sleep, hydration, and environment also play key roles. The best solution though is to do all of these in combination and in that order, inhibit, lengthen, activate, integrate. Look at yourself locally and globally. This is why you need a coach to put it all together with you. And hence why the idea of, "oh I'll learn some exercises and do it all on my own" is so ineffective. That would only work on rare occasions and only for people who never needed training anyway because they were genetically so superb they could get away with that attitude. We are growing fatter, sicker, and more injured yet the solutions are getting less and less individualized. We need group classes, or semi-private training, or DVDs? The worse we get the less hands on it needs to be? We are not beings of logic, but we do like bargains. *With all the body work treatments, remember you are working on muscle, not tendons or ligaments or bones. DO NOT roll out your vertebrae no matter how good it feels. Stop just treating the symptom, or self diagnosing, or using cure-alls or magic pills. Use this article as a manual, almost everything you feel will fit into these categories. Now there are issues that may be biological, genetic, structural, chemical, or caused by some surgery, treatment, or illness that are very unique that may not be helped much or contraindicated by some of these methods. ALWAYS consult a specialist first, a good one. Not all calories are created equal and neither are specialists.